We connect residential and commercial customers with licensed, bonded, and insured trenchless pipe bursting professionals and experts for FREE. Fill out the form below to get connected with the best trenchless pipe bursting experts in your area. Trenchless pipe bursting is an extremely difficult and extensive pipe restoration process. Some reasons for pipe bursting include collapsed pipe sections or pipe that cannot be repaired by lining. Trenchless pipe bursting can also be used to increase the diameter of pipes if desired. As seen in the picture above, a burst head is attached to a bursting hammer and the new pipe. It is then inserted into the old pipe and pulled using either a pneumatic, hydraulic expansion, or static pull to burst the old pipe and replace it with new pipe along the same pipe line. Launching and receiving pits replace the traditional trenches that need to be dug for traditional pipe restoration. Again, this is a highly specialized pipe restoration process and should only be performed by experts that are licensed, bonded, insured, experience, and vetted. 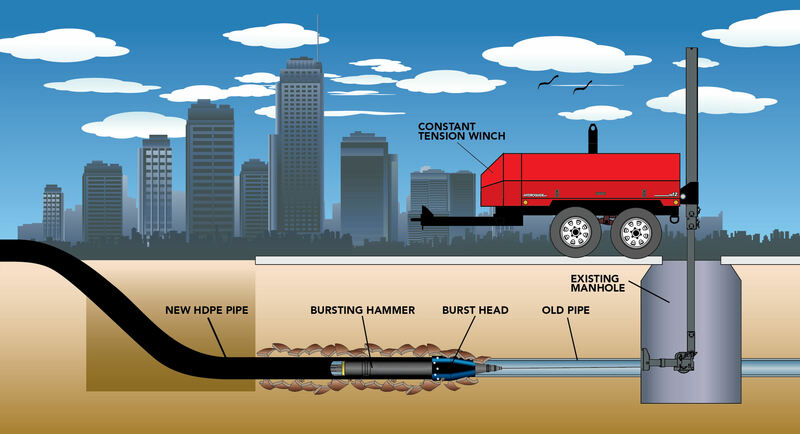 What type of structures can benefit from trenchless pipe bursting?